10th November 1918: The Australian 1st and 4th Divisions began to move forward to relieve the British 32nd and 66th Divisions beyond Le Cateau. Their progress was slowed by time delayed mines that demolished railway, road junctions and bridges. 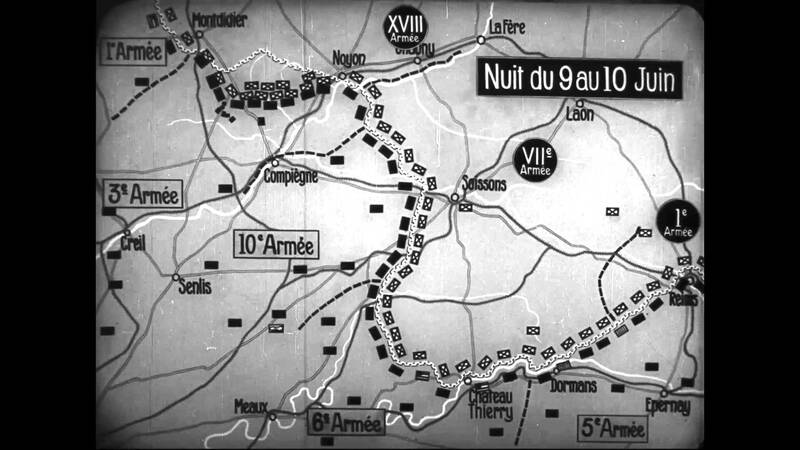 Later that night Marshal Foch ordered that all operations were to cease at 11am the next day. 14th June 1918: A German counter-attack on posts lost in the Meteren area resulted in losses of ground and some prisoners. AIF 1st Division General Walker called his brigade commanders together and they agreed that signs of an impending German offensive were accumulating and it was decided to assume battle-stations on the night of the 15th June. For the Australians tasked with going out daily to bring back prisoners, no sign of an impending attack could be seen. 13th June 1918: Two companies of the 7th Battalion behind a barrage placed by artillery, trench mortars and machine-guns pushed forward 500 yards on a front of 650 yards, and although losing 20 men captured 47 prisoners, mostly young and small men. 10th June 1918: Active patrolling was maintained and continued to yield a steady stream of prisoners for intelligence gathering purposes as well as provide further slices of ground in important areas such as the on the Morlancourt ridge. One such large and successful dusk raid by Rosenthal’s AIF 2nd Division led by the 7th Brigade captured part of the ridge between Sailly-Laurette and Morlancourt resulting in 330 prisoners and 33 machine guns. Demonstrations by the Australian infantry and artillery on both of the flanks of the 7th Brigade’s attack succeeded in causing the Germans there to believe that the front of the assault was much wider than was actually the case. Under the northern extension of the barrage the 6th Brigade (22nd Battalion) had raided the Germans on the spur between Ville and Morlancourt. Led by Lieut. Harricks the 22nd Battalion raiders fought without suffering a casualty and brought back 6 prisoners and a machine gun. Farther north the 23rd Battalion attempted to enter the German trench opposite the old Casualty Clearing Station near Dernancourt but failed losing three killed and 18 wounded. On the southern flank demonstrations on the front of the AIF 3rd & 4th Divisions consisted of artillery fire only. Investigations and analysis after the raid concluded that the enemy was showing no signs of any preparations for a further attack in this area, and was indeed focusing his efforts further south and to the French. In addition The Diggers felt that if asked they could have gone further and even captured the German artillery. Further bold raids by the 4th, 6th and 10th Brigades on the nights of the 13th-15th June confirmed these impressions. 8th June 1918: In order to predict where the next German attack was going to happen, the need to identify which enemy troops were manning the front became ever important. Raiding thus became a priority, and continued to be to help pin enemy forces and help the French to the south. To the north General Plumer informed AIF 1st Division the need to man the front with two brigades in preparation for the resumption of the German offensive, with the 1st Brigade now joining its sister 2nd Brigade. As events would unfold in the coming hours, the attack would not fall in the north but on the French once more at Noyon and the Matz River (picture above, right). However the intelligence from the constant stream of prisoners being brought in by the very active 1st Division still said that an attack would fall in Flanders. 6th June 1918: In preparation for the next phase of the German Spring Offensive Lieutenant-General Monash held his first conference with his divisional commanders to discuss the disposition of troops and artillery in order to negate the effective enemy barrage used in the battle-zone. Major-General Hobbs pointed out that for the first time all those present, generals and staff officers, were members of the Australian Imperial Force. 5th June 1918: In the Meteren area the 2nd Brigade, having just relieved the 3rd Brigade quietly advanced its outposts by a quarter of a mile. At this point the German trench forces were being kept under strain without reinforcements as all major attacking forces were being kept to the rear in preparation for the anticipated resumption of the attack in the north once British reserves had been sucked south to help the French. For the Australians they were told to expect a major German advance any day. 4th June 1918: Following a fierce bombardment of every type of light and medium shell, the Germans raided against the outposts and front line trench of the 19th Battalion north of the Bray – Corbie road. Faced with a determined defence and men charging from the flank the attack failed in its mission and no prisoners were taken. The attack convinced the Australians of the need to occupy a continuous trench and not just isolated posts. Not only did it enable lateral communication, but the Germans would not know which parts were occupied or not and therefore would waste effort by their artillery and infantry on empty lengths of the front. 11th June 1918: At Compiegne a sudden French counter-attack by four divisions and 150 tanks with no preliminary bombardment, caught the Germans by surprise and halted their advance. Gneisenau was called off two days later, and losses were approximately 35,000 Allied and 30,000 German. 9th June 1918: Ludendorff sought to extend Blücher-Yorck westward with Operation Gneisenau, the last of the four great operations in the Kaiserschlacht, intending to draw yet more Allied reserves south, widen the German salient and link with the German salient to the north at Amiens. The French had been warned of this attack by information from German prisoners, and their defence in depth reduced the impact of the opening artillery bombardment. Nonetheless, the German advance consisting of 21 divisions attacking over a 23 miles front along the Matz River was impressive, resulting in gains of 9 miles despite fierce French and American resistance.